Walking through the immaculate, well-organized aisles of Junction City Local Aid’s food pantry, Jeanie Burr chatted happily with volunteer Peggy Saltz about produce. Jim, another shopper who declined to give his last name, also seemed to be enjoying his trip to the pantry. A big man with a long white beard, Jim smiled as he described his love for super-spicy peppers. Another volunteer placed a bottle of Tabasco in his basket. 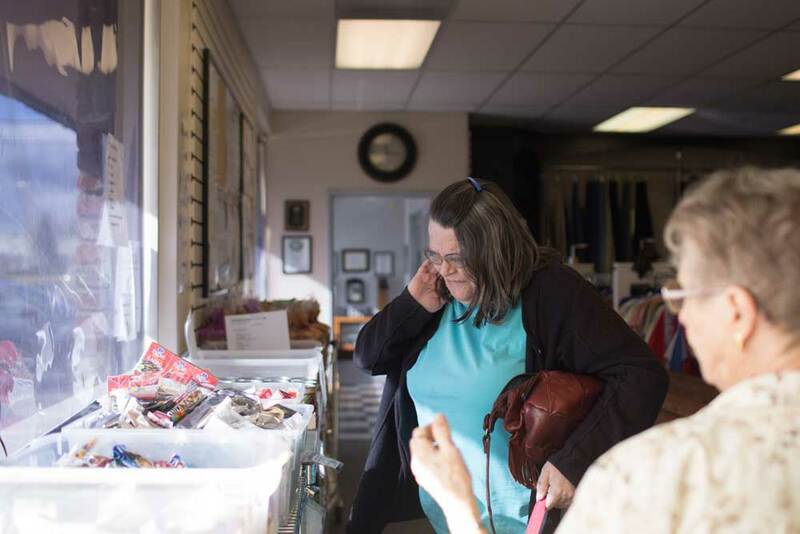 Burr and Jim said they felt no stigma accessing the pantry, even in a small town like Junction City, home to about 6,000 residents, in Lane County. It’s a place where “everybody knows everybody, so everybody knows if you’re having a hard time,” said the pantry’s executive director, Kori Rodley. It’s trips like these that have become normal for some families as a way to offset the burden of housing costs, even in rural areas. Food pantries are often the easiest way to fill monthly budget gaps caused by less elastic costs for housing, medical needs and transportation. And the Oregon Food Bank, a statewide network of 21 regional food banks that serve 468 pantries like Junction City’s – plus another 179 meal sites and 596 supplemental programs and partners – is seeing the pressures of housing costs spill into their work. Anneliese Koehler, Oregon Food Bank’s public policy advocate, said the rates of hunger started to climb during the recession and have never dropped back to what they were before. According to a study by Mark Edwards of Oregon State University’s Rural Studies Program, the percentage of Oregonians experiencing food insecurity between 2013 and 2015 rose from 11.9 to 16.1 percent. The U.S. Bureau of Housing and Urban Development’s standard for what is considered “affordable housing” is that rent or mortgage costs consume no more than 30 percent of a household income. In Lane County, one out of three renters pays more than 50 percent of income in rent, according to the advocacy network Oregon Housing Alliance. For every 100 families with extremely low incomes, there are only 15 affordable units available. Homes For Good, the county’s housing authority and the state’s second largest, opened up a Section 8 wait-list last year. Nearly 5,000 people signed up in two weeks. Spokesperson Ela Kubok said that’s twice the number from an opening five years ago. Between its public housing and Section 8 wait lists, there are 6,040 applicants waiting for Homes For Good housing assistance, representing 12,195 people. The agency’s executive director, Jacob Fox, said the area’s housing crisis hasn’t been quite as acute as in Multnomah County, but is seeing “very aggressive” rent increases that are rapidly bringing it to that level. Realtor.com placed nearby Eugene as the second-tightest housing market in the nation last year, after Seattle; Portland came in eighth. According to the U.S. Census Bureau, Lane County’s poverty rate approaches 20 percent, compared with a statewide average of just over 13 percent. Rodley said Junction City has seen an influx of new residents from Eugene, about 15 miles south. Some are surprised to realize there are poor or homeless people living there, too. New housing built to accommodate them is “not necessarily affordable” for most Junction City regulars, Rodley said. The pantry serves working-class families, whose needs may tilt toward short-term crises, but for aging Baby Boomers and those with disabilities, “we are a key piece of their (long-term) puzzle,” Rodley said. Housing has become intertwined with Oregon Food Bank’s agenda, ranking just behind low wages and unemployment in terms of driving the need for emergency food services. That’s Junction City, said pantry volunteer Jan Reel. “The biggest complaint that I hear is, ‘I can’t afford an apartment. If I did, I couldn’t pay anything else,’” Reel said. According to Junction City Local Aid’s data, the organization has seen a steady increase in those seeking help at the pantry since 2012. This past year, the pantry served 8,745 people — an increase of more than 1,500 compared with five years ago. Trips through the pantry have increased an average of 518 a month, to 3,043 last year. Jim shops for food Feb. 14 at Junction City Local Aid’s food pantry. For Jim and his wife, just as for Burr, getting food at the pantry is offsetting the cost of fixed expenses, such as a mobile home or motorhome and medical bills. Jim, 78, lives with his wife and their 18-year-old cat, Guy, in a 40-foot National Coach motor home. He has two doctorates, he said, and has written three books. “It’s cheaper than housing,” Jim said of the motor home, adding that he has had serious medical issues, including kidney failure. Jim and his wife survive on a combined $2,000 a month in Social Security, plus $50 a month in royalties from his books. They stay at the local Guaranty RV Park and owe the company $3,000 for repairs, which translates into monthly payments of $500 or more, Jim said. “Oregon is an expensive state for the low income,” Jim said, noting that he’s traveled to 48 states. Oregon Food Bank and Junction City Local Aid are “phenomenal,” he said. Their help saves his household $200 to $250 a month. “It’s a constant balancing act,” Jim said. Jeanie Burr sorts through the weekly grocery options at Junction City Local Aid’s food pantry Feb. 14. Burr said she and her husband, who live on $1,200 a month from their two Social Security incomes, pay $300 per month for food on top of what they get from the pantry. Burr smiled as she spoke of waking up on Valentine’s Day, the day Street Roots visited Junction City Local Aid, to a card her husband made by hand. For 12 years, the couple have rented a space at Tivoli Mobile Home Park, which was purchased by St. Vincent de Paul of Lane County in 2016. “They really cleaned it up,” Burr said. They also discontinued the previous owner’s practice of raising rents every year by the same amount as Social Security cost-of-living increases, Burr said. Her household lives on $1,200 a month from their two Social Security incomes, she said, and the couple pay $300 per month for food – on top of what they get from the food pantry. Country Coach, a high-end RV manufacturer, shuttered its Junction City operations in 2009, putting nearly 500 people out of work. What had been a solid, lucrative industry for the region became a casuality of the Great Recession. In 2011, Ronald Lee, one of the founders of the business, restarted a scaled-down business in Junction City, but the economic gap caused by Country Coach’s downsizing remains today. Ironically, the downsizing gave Junction City Local Aid its current home. Its brightly lit storefront was once a Country Coach motorhome repair facility, said Ed LaGrone, a former sheriff’s deputy who volunteers. “They sold it to us cheaply,” LaGrone recalled. 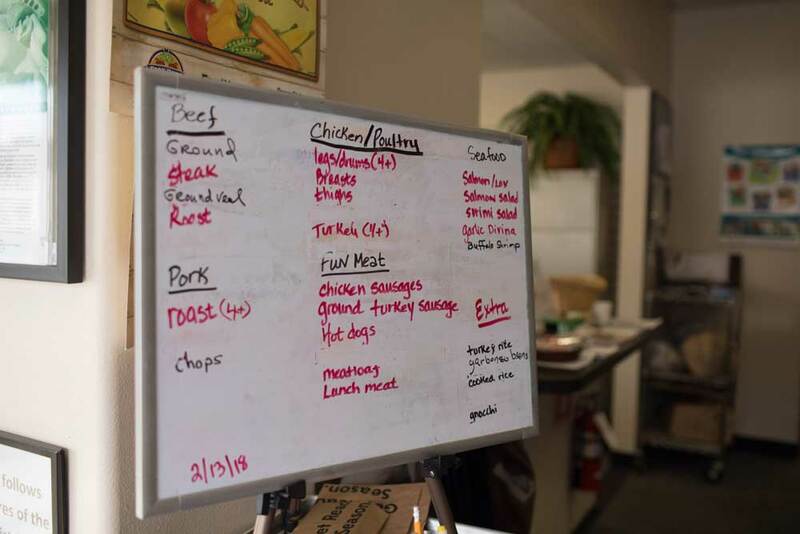 A list of the fresh meat options is displayed Feb. 14 at Lane County food pantry in Junction City. 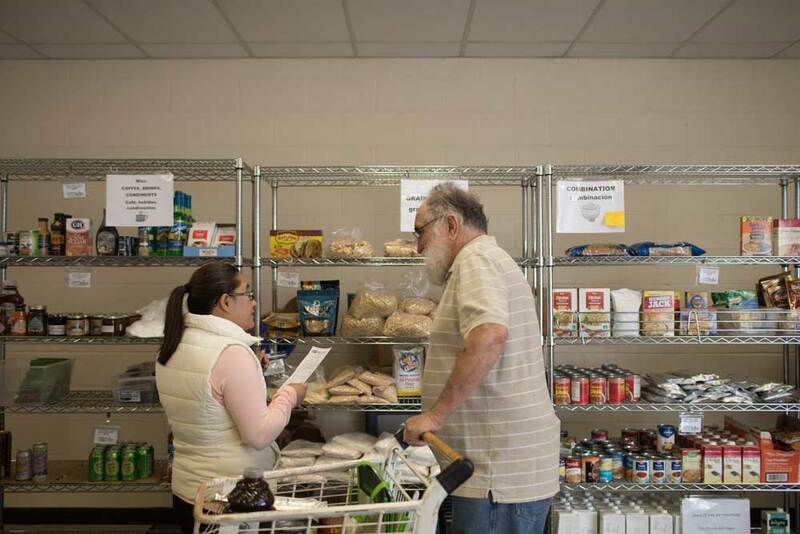 One of the clients who came to Junction City Local Aid, a woman named Nancy, was turned away once it became clear that a different food pantry, FISH in Eugene, was closer to her home address. Clad in a maroon shawl and matching T-shirt, Nancy spoke with Street Roots before leaving. She said she was passing through Junction City while seeking a forklift driver job at the Hull-Oakes Lumber Mill. The mill is “way out in the woods” in the foothills of the Coast Mountain Range. Nancy lives in a Section 8 subsidized apartment, and made $335 in a recent month. Her rent is $126 per month. “I want that job at the mill,” she said. To make ends meet, she’s turned to energy assistance and food pantries, which she views as just part of surviving. “I go (to food pantries) periodically, whenever there’s a need,” she said. She sold her children’s PlayStation, and she’s thinking of selling her motorcycle on Craigslist. “I’m going to go sell a little bit of my food stamps,” she said, adding that she has a friend who pays 90 cents on the dollar for SNAP, which Nancy considers a good rate. “It’s crazy. I have to trade SNAP to get a little money, but then I have to go to the food pantry,” Nancy said with a short, dry laugh. Selling SNAP benefits for cash is illegal. But Nancy said she needs the money to pay her electric bill. Studies have shown that illicit SNAP sales are rare. The nationwide SNAP trafficking rate was just 1.5 percent in December 2016, according to the U.S. Department of Agriculture. The SNAP program issued about $70 billion in benefits in fiscal year 2017, helping nearly 46 million low-income individuals each month. For Nancy, selling some of her SNAP benefits is just doing what it takes to feed and shelter her family, she said. She’s chosen to remain in her apartment after her daughter moved out last month, she said. That puts the household in conflict with required occupancy standards, which in Nancy’s case would mean paying higher rent. It also means not having to find a new place in an ultratight market or to come up with a new security deposit and moving costs. “Any family will do anything in their power to keep a roof over their head,” said Kubok, of Homes For Good. 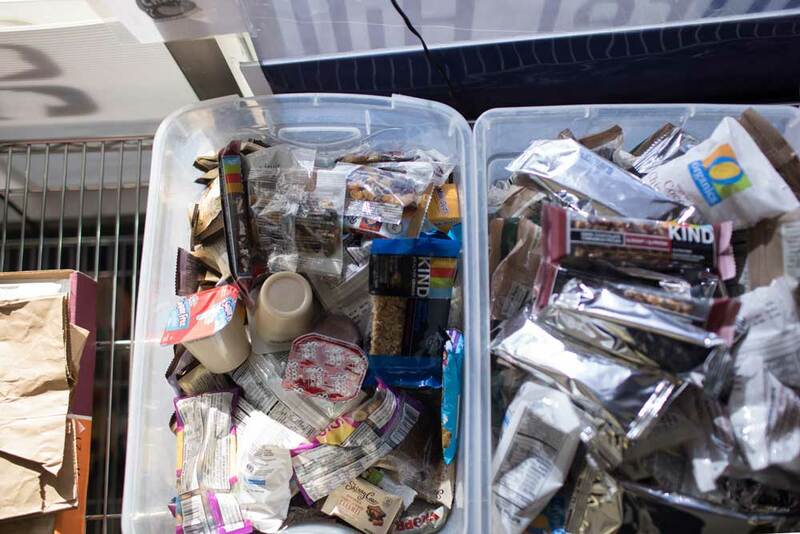 The Harvest Boxes reportedly would feature goods that sit on shelves for months or years: peanut butter, canned goods, pasta, cereal, shelf-stable milk. Such a move could drive more people toward Oregon Food Bank’s modern, choice-based and produce-heavy network. However, the unpopular proposal is not expected to come to fruition. The New York Times reported that White House officials acknowledged the plan was a political maneuver and was not viable. Various snacks are among the offerings at Junction City Local Aid’s food pantry. Oregon Food Bank’s huge, office-warehouse complex on Northeast 33rd Street in Portland sits at the hub of its statewide network. The network served 90 million pounds of food in 2016, an average of 270,000 Oregonians a month. Its total support and revenue stream was $22 million last year. Housing has been a major area of interest for years at Oregon Food Bank, Koehler said. The nonprofit’s glossy brochures tell stories of Oregonians for whom food insecurity or hunger has gone hand-in-hand with housing instability or homelessness. Food is the most elastic part of many households’ monthly budgets, Koehler said – much more amenable to creative solutions than paying rent or mortgages. Thirty-nine percent of Oregon Food Bank clients rent, 27 percent own a home or mobile home, 12 percent live in subsidized housing, 11 percent are in shared housing, and 11 percent are homeless. And there’s another subset who’s needs grow with each passing year. Pantry volunteer Reel lives on Social Security and a small retirement income. Her SNAP benefits are $15 a month, she said. She’s also a customer of the food pantry’s resources. 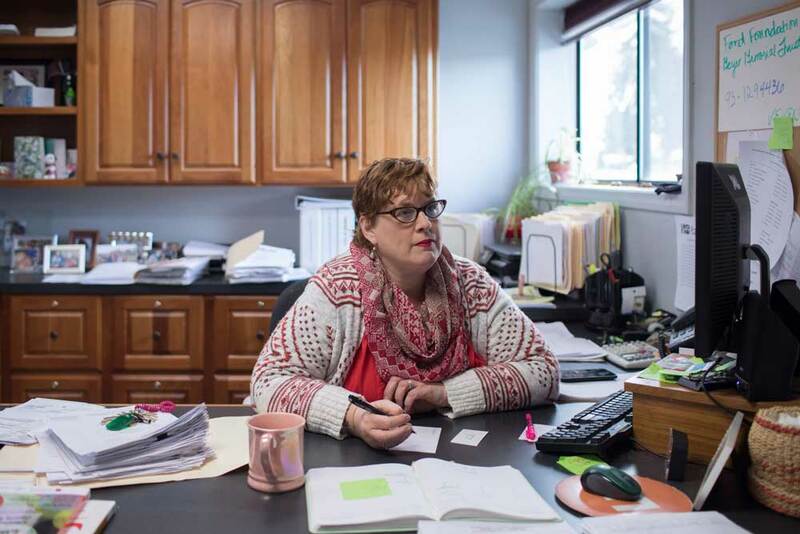 For Rodley, Junction City Local Aid’s director, having volunteers who are also clients is part of being in a close-knit town. 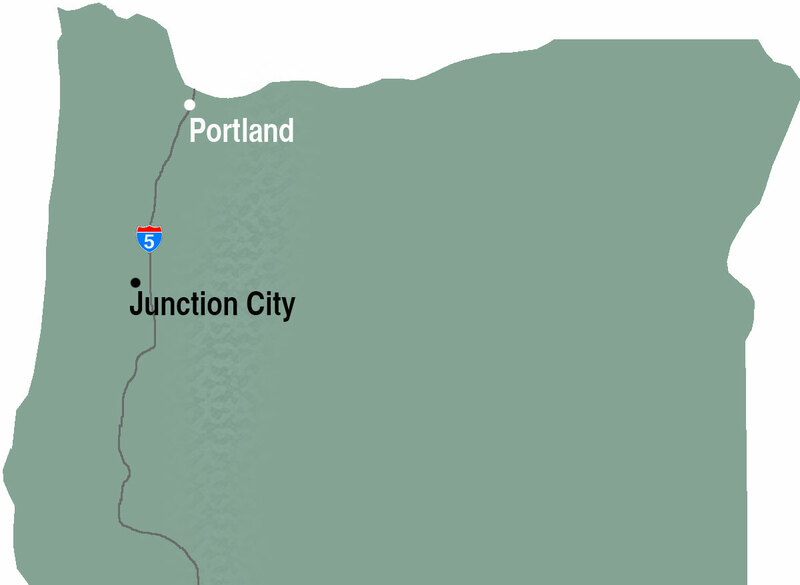 Kori Rodley, the director at Junction City Local Aid in Lane County, said housing instability and food insecurity are as big of a problem in rural areas as in urban areas. Rodley says her organization struggles with the question of whether or how to become involved in housing. Junction City Local Aid offers assistance with medical prescriptions, transportation assistance, electricity and propane bills, clothes and food. But Rodley said it can’t compete financially for bigger-dollar, housing-related projects such as mobile-home park purchases. Meanwhile, Oregon Food Bank’s literal bread and butter relies on the generosity of the private sector. Homes For Good’s executive director, Fox, said it’s doing everything it can to tighten belts, including consolidating two administrative buildings into one. It is also exploring a partnership with Square One Villages, which creates low-cost tiny-house villages. For its part, Oregon Food Bank’s network continues to focus on serving hungry and food-insecure Oregonians. It’s no small job. Rodley’s Junction City Local Aid staff and volunteers will keep giving away a variety of foodstuffs to Junction City locals: roast pork, steak and chicken thighs, grains, cans of kidney beans, Hungry Jack and Kind granola bars. Jeanie Burr and Jim are almost certain to be back.